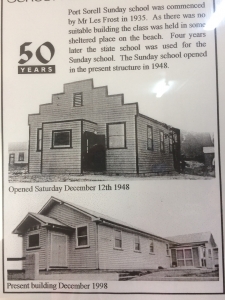 Port Sorell Sunday School was commenced by Mr Les Frost from Devonport on the 15th September 1935. As there was no suitable building in which to hold the Sunday School classes, they were held in a sheltered place on the beach or in the shelter shed of the Port Sorell picnic reserve. Mr Frost carried on this way for 4 years. 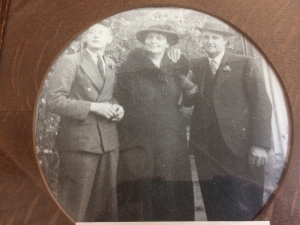 In 1940, he handed over the Sunday School to Mr and Mrs H. O. Parker at which time the state school was secured. Permission to use the school depended on the teacher. Eventually one teacher refused to allow the running of Sunday School on the school premises. This meant moving the classes to the school shelter shed. By 1945, Gospel Services had also begun being held at the school. By 1948 it was necessary to find somewhere else to hold Sunday School. Mr Parker looked around the Port Sorell area, and came across a vacant block of land. He enquired about the owner and was told that the owner did not live in the area, but did ‘happen’ to be in Port Sorell at that particular time. The owner of the block was Mr T.H.G. Bosworth. Mr Parker asked about potentially purchasing the block of land. He discussed with Mr Bosworth his reasons for needing the land and at the end of the conversation, Mr Bosworth donated the block of land for free. There was great rejoicing and thanks to God for His provision. The Devonport Elders were approached about building a Sunday School Hall on the block, and the idea was agreed upon. The foundation was done, the framework went up and the roof installed with the help of many volunteers. Sunday School was held with no walls, but did have a floor and roof. The building was rapidly completed and was officially opened on Saturday December 12th 1948. The next day was the Sunday School anniversary. In 1951 Sunday School ran for one Sunday, but due to a polio outbreak was then closed for 3 months. It re-commenced on the first Sunday in April. It was found necessary to build a room on the back of the main building and this was done in the form of a skillion addition. In 1961 the present day back room and kitchen was built, replacing the skillion structure. In 1976 the building located on the back of the block was purchased and transported from Gowrie Park. The owner, on learning that it was going to be used for Sunday School and Youth work sold it at a very reasonable price. On the 18th September, 2014 the registered name for the church changed from Port Sorell Gospel Chapel to Lighthouse Christian Fellowship Port Sorell. Sunday School continues to operate every Sunday morning during school terms from 9:30am, followed by the weekly Sunday morning worship service at 10:30am.